In this article let us analyze the current market scenario, how Nifty has performed during last 4 years and comparison of index vis a vis some of the individual index stocks. As of now, there is no significant threat to the indices. No major reversal sign has been observed in the monthly charts of Nifty. Watch the reversal patterns displayed in the chart below. 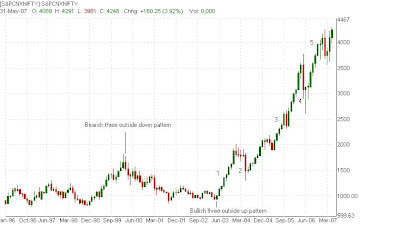 Bearish “three outside down” pattern occurred in April 2000 and bullish “three outside up” pattern was seen in June 2003. Since then, Indian markets are on a high. In the absence of strong reversal signs, it may be concluded that markets will continue their uptrend. This means that after the completion of the 5th wave (which needs a confirmation) a downtrend is likely to begin. The longer term target for the Nifty, when calculated from a low of 920, works out to 4600. This will give wave 5 a gain of 177.20%. What is the reason behind this huge rise in index? Like all other financial markets, Indian markets are also governed by the fundamental principles of demand and supply gap. When interest rates were lowered, stock market looked an attractive option and investors began to look for opportunities. Huge foreign funds are another reason for the upsurge. Liquidity is one more factor – one can easily transact with a click of a mouse unlike the old days when physical share certificates were in use. Whatever be the reason behind any move, it is always reflected in the charts. All other factors, namely, business conditions, economy growth etc. are always discounted when analyzing the market technically. How many stocks got benefited from this nearly five fold rise in index in the last 4 years? Let us analyze some of the index stocks. It can been seen from the above table that not all the index stocks have performed in the same manner. ABB, BHARTIARTL and SAIL have outperformed when compared to the overall index. It should be noted here, that the ‘performance’ in stock market by a scrip has nothing to do with the financial performance of the company. It just implies that the investors have chased this stock more strongly compared to the rest. We can see no direct relationship between the overall index performance and the individual stocks’ performance. This indicates the demand and supply gap scenario for the stocks discussed. What could be the reason for the uneven performance? When thousands of people are trading a particular stock, no one can be very clear of what the other trader thinks. This leads to volatility and uncertainty in the markets. When one person buys a stock, obvious reason is that he thinks that it will go up. The person who sold the stock thought that it would either go down or he had enough profit or loss. In a complex scenario like this, price fluctuations happen regularly. The investor needs to take advantage of the situation by buying when the demand just starts picking up for the stock and sell when it just starts diminishing. Having said that it is difficult for an ordinary investor to completely understand and assess the market status. What can the investor do now? Ideally, one would like to take some money home. If one has remained a long term investor and likely to get some profit, he can book it. Remember that the chance of the profit going down may increase with the time a stock being held. For the one who wants to invest for long term in stocks, he has to be cautious, as can be seen from the charts and tables provided. Not too many people understand the stock market dynamics. So take professional advice, consult a qualified and experienced person. He may charge you a little, but it is worth taking the risk than worrying later. Invest the amount that you can afford to lose. There are only probabilities, no certainties in financial markets. Keep doing your research. Observe prices at least once a week. If you think you gained a reasonable amount, book your profits at least partially. Last but not least, never borrow money to invest in stocks thinking that prices will always go up!